Hands4Hire is a refreshingly different type of handyman company that actually delivers excellent customer service. We focus on small home repairs and improvements as well as larger remodeling projects. Our team of expert technicians is fully insured and background checked. We work with real estate agents assisting with home sale repairs. We also work with residential and homeowner community property managers. Hands4Hire technicians are the best in the business. They are uniquely talented as skilled craftsmen, highly professional, organized and friendly and courteous. You will notice this the moment they take off their shoes when they enter your house. They are extremely efficient and proud to be the face of the company. 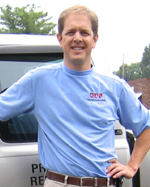 Chris started Hands4Hire Professional Handymen in 2004. His received his undergraduate degree in Engineering and has an MBA from the University of South Carolina. Chris served in US Army, has worked in manufacturing as an engineer and in sales in the technology field. If you call Hands4hire you will have the pleasure of letting Robyne schedule and manage the work we do. Robyne is masterful at keeping the technicians in line and managing our jigsaw puzzle of a schedule while always keeping a smile on her face. Jim is a native of Long Island NY, who moved south a few years ago. 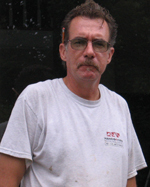 He has a great attitude and stong overall skills with particular expertise in flooring, ceramic tile and carpentry. Jim is a lifelong Steeler's Fan! Kevin has worked for Hands4Hire since 2005 after a long career at the airline industry. There is not much Kevin can't do and he has particular expertise with exterior repairs such as wood rot and siding repairs. If Kevin has done work at your house you will also so find out that his other passion is playing blue grass bango. He is an accomplished musican. Art loves to work with customers and has a great attention to detail. Did you know that we do this? In this issue: Protecting your home, Home staging, Green tips, etc.